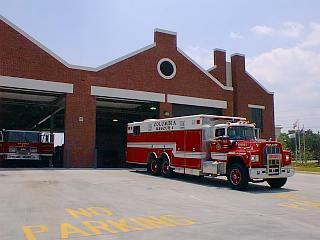 The Columbia Fire Department Headquarters moved to a beautiful new building in 1995 and a front portion of the new building is dedicated to preserving Columbia Fire Department memorabilia. The museum educates the public about the importance of the Columbia Fire Department and the professional men and women within its service. 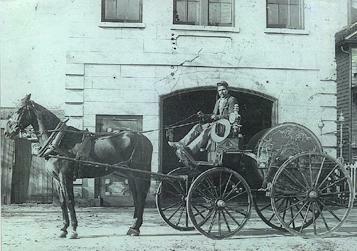 Photo: 1890's Picture of City of Columbia Volunteer Fireman and equipment. Many other interesting pictures documenting the history of the department -- employees, equipment and firefighters in action -- are on display. With a little grant money and a lot of research and hard work, Fire Department employees opened the museum in October 1996 that showcases the rich history and tradition of the state's largest fire department. 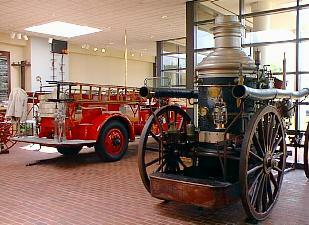 Museum attractions date back as far as the mid 1800's and include a 1929 American LaFrance fire engine and 1903 horse-drawn steamer, other equipment from days gone by, a photo history of firefighting in Columbia and pictures of the six fire chiefs that have served Columbia since the early 1900's. The Columbia Fire Department continues to serve in its heroic tradition with some of the finest equipment available. The museum is at the entrance of the Columbia Fire Department Headquarters at 1800 Laurel Street. It is open weekdays 8:30 a.m. - 5 p.m. and on weekends by appointment. For information call: (803) 733-8350. My thanks to Fire Marshall John Reich (museum curator) for providing personal tour and additional information.